What is Patellar Tendon Knee Straps? Of all the various parts of the body, the knee is probably the most susceptible part to injuries and sprains during sports, workouts and play. It is therefore understandable when you see many competitive sportsmen who endure one form of knee injury or the other, often, for the rest of their lives. The truth is that no matter how careful you are and how many different ways you try to avoid it, if you’re an active athlete, you will definitely suffer a form of injury to your knee at one point or the other in your life, making knee bands (or straps) a necessity. 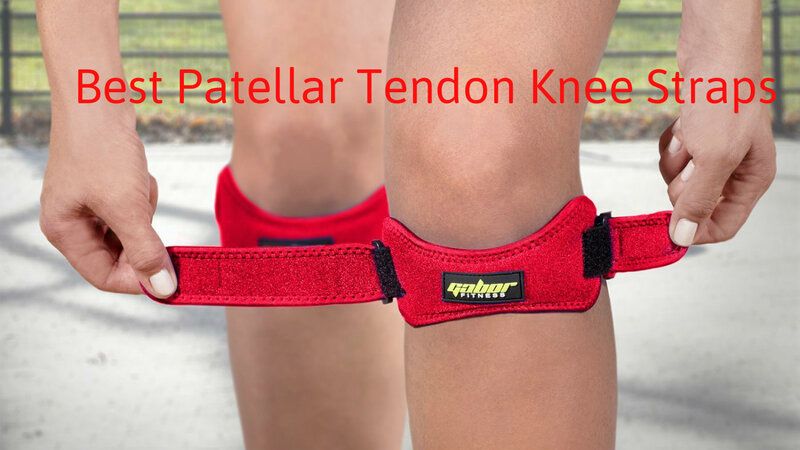 Patellar tendon straps (or infrapatellar straps) are used to help with quite a number of knee problems. Although simple in appearance and working, they are super effective and a must-have if you engage in very demanding physical activities such as running, jumping, or any other sport that puts a lot of pressure on your knees. The way they are designed, knee bands put some pressure over your patella tendon and this pressure helps to support your kneecap (patella). When this happens, your patella tracking (a term used to refer to the movement of your kneecap) is much improved and of course, a lot painless. In all, knee bands are great because they help to prevent the significant force from getting through the kneecap and into the patella tendon. How do Patellar Tendon Knee Straps Work? Merely looking at the average knee strap, it isn’t supposed to work. After all, it is barely more than a common strap sitting below your kneecap. Period. Yet, somehow it still works, with many athletes around the world swearing by it. This “common” knee band has helped thousands of athletes support their injured knees during play, as well as helped them prevent suffering further injuries to the knee. But if this is true, then how exactly do they work? First of all, let’s understand the malady. Knee pain can be caused by a number of factors. However, the most common you’d see is the patella-femoral pain syndrome (PFPS). This syndrome occurs when there is a constant meeting of the femur with the kneecap (the underside of it) which in turn, of course, causes pain. As an athlete, you already run a risk of having this syndrome, whether you’re a baller or a runner. But this risk is significantly increased in female athletes especially those with knock-knees, or more correctly, an exaggerated Q-angle formed around the knee area. Frequent and constant running, weightlifting, jumping, and even an activity as mundane as climbing stairs can add up to make this syndrome so bad that it becomes a constant, throbbing pain in the knees. It is usually used just below the patella. Now, the idea of the working of the knee strap is to apply pressure on the patellar tendon so that the knee mechanism can be tightened. The reason we want the knee mechanism tightened is because it will help to support the kneecap so that it won’t keep bumping into the femur and then cause pain. There are two big advantages of this. The first one is the most obvious; with a less frequent bumping into the femur, movements around the kneecap can be less painful. But even bigger is that it helps to maintain the cartilage at the knee which will just keep degenerating if not attended to and cause bigger structural problems. When Should I use a Patellar Tendon Knee Strap? There are various kinds of knee problems that might necessitate your using a knee strap and these problems are widely varied. However, here are some major knee problems that warrant using a knee strap. Once you’re diagnosed with any of these, then giddy up cos it’s time to get you a knee band. Knee problems like Osgood Schlatters, Runners Knee, Iliotibial Band Syndrome, Patellar Tendonitis (Jumper’s Knee), and Chondromalacia patella. Patellar tendon knee straps are grouped into three major types: the single, the double, and the magnetic. For the sake of this article though, we will be discussing the single and double knee straps alone. Let’s check them out. Single Knee Straps: These are the most common types of knee straps available in the market, and they usually come with a universal fit (i.e. “one size fits all”). Although they simply go below the kneecap alone, single knee straps work for almost any type of knee problem. Double Knee Straps: Unlike single knee straps, double knee straps, as their names sound, have two straps with one going above the kneecap and the other staying below. Double knee straps are best for knee problems like Iliotibial band syndrome. But they can also be used for the same knee problems as catered to by single knee straps. In fact, some people seem to prefer double knee straps for the extra support above the knee and sides that they afford. As its name implies, Run Forever Sports wants to help its customers achieve their dreams of maintaining a healthy, active lifestyle for as long as they live. Unfazed by injuries and the ubiquitousness of poorly made sports products, this brand has stuck to its guns by manufacturing amazing top-quality sport gear that help customers achieve their fitness goals, even when injured. These top quality gear are unique and affordable. And being made by sport people themselves, you can be sure that they come with every feature necessary to ensure that you enjoy your activity in comfort. 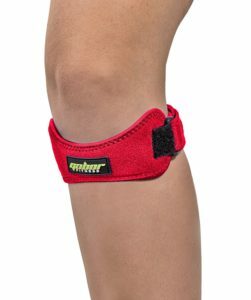 If you’re an active athlete; sprains, injuries and bruises must be second nature by now, so naturally, you should always have a great pair of patella tendon knee straps on hand. Today, we have a fantastic pair of knee straps for running, soccer, squats, and the like for you. Meet the Run Forever Patella Strap Knee Brace. 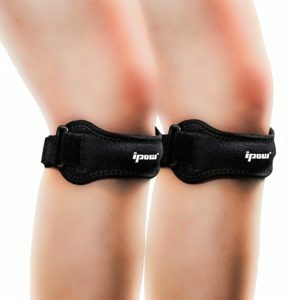 With this pair of knee straps, you can now continue to lead your active life without taking a break or bothering with the excruciating pain that an injured patella often brings. Each knee strap goes below your patella and around your knee just on top of your patella tendon. By doing this, your patella gets relieved of the tension that should normally have come to it and this gives you immediate relief from pain. Taking into cognizance the different knee sizes and shapes there are, these straps are made to come adjustable, making it possible for you to work around the straps to get the best compression that gives you the most relief. These straps are made with a curve to fit the curve of your knees superbly. This way, they maintain their positions on your knees as they take the pressure off your patella tendon so you can have a painless and seamless workout. It comes with a universal fit; accommodating most people, male or female. Plus, either strap can work for either knee, left or right. Now, you don’t have to bother about which is which while fitting the straps. Might seem like a small thing until you have to take off a strap and fit it all over again just because it’s the wrong strap for the wrong knee. For your absolute comfort, you’d find that these non-scratchy patella straps are made of quality materials, making them soft, lightweight and durable. Since they are readily absorbent, they take up the sweat which prevents the itchy, wet feeling that often comes with using anything around your knees. Gabor Fitness has been in the game for years. Founded many years back, the brand has committed itself to making the best sporting gear it can possibly make with a keen eye for quality and appearance. All goods offered by Gabor Fitness in its different product lines attend to the many differing and evolving needs of various sportsmen around the world from simple workout gear to complex sport equipment and supplies. And because it brings great joy to this brand seeing customers thriving in health through effective workout routines, Gabor Fitness ensures that all of its products are offered at very affordable prices. Let’s not forget that it’s got a super customer service as well. Altogether, this is a brand to beat. For the jumpers (ballers and the rest) among us, we’ve got wonderful jumper’s knee straps with your name on it. We all know the infamous jumper’s knee that plagues many a baller, and let’s not forget the runner’s knee as well. All too often, these injuries occur and consequently hamper their otherwise active lifestyles. Well, this knee strap is here to change all that. By applying pressure on your patella tendon, these knee straps ensure that you experience little or no pain while you carry on with your sport. They also help to improve the elevation and tracking of your patella as well. To ensure that the straps fit, the manufacturers have designed them to come with buckles and Velcro straps at the front and at the back respectively. These allow your straps to be easily adjustable so, however you like the pressure of your compression or whatever shape or size of knee you have, you shouldn’t have any problems using these knee support bands. One thing about most knee straps or knee accessories in general is that they can get in the way if they are too bulky, but not this one. The materials for the design of these straps were carefully selected to ensure that they produce only a soft and lightweight knee strap that you’d hardly notice while you carry on with your activity. Although they come in pairs, there is no right or left knee. Either brace will accommodate either right or left knee well, always giving a comfortable and snug fit per time. Abco Tech, a parent company to Abco Sport, has a vision and that vision is to deliver only the best and the highest quality products to its clients. This vision takes commitment, a value that Abco Tech never seems to run out of. In fact, it was that commitment that led to the birthing of Abco Sport, a subsidiary of the parent company with a focus on manufacturing smart products that help to make everyday life simpler and easier. Always thinking out of the box, Abco Sport has won the hearts of many a customer by developing futuristic products with features that are both cool and smart, somehow effectively combining intelligent with simple. The goal is just to ensure that you can go through your daily activities with a lot more ease and Abco Sport realizes this goal in the most amazing ways possible. Also, without a doubt, this brand sure gets a gold star for customer support. Or why else are all its clients head over heels?! 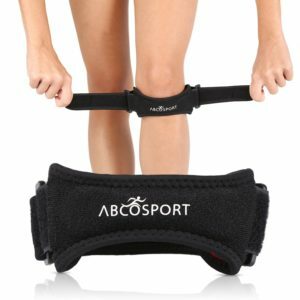 We present to you the Abco Sports Patella Knee Strap as it embodies what this brand stands for and is a great knee band for you. With the materials from which this knee band is made, you can be sure that it will be extremely comfortable and equally importantly, durable. No sense getting a knee band that will go bad in no time flat. Also, it is non-scratchy, super light and, oh, so soft. We’re pretty sure you know why you need a lightweight knee strap. If your knee strap is bulky, it can get very uncomfortable and very restrictive making you unable to enjoy your game. This knee band easily changes that narrative. And because it absorbs sweat, you can be sure that it won’t get slippery and begin to slip off your knee mid-game. More importantly, it does the job it is meant to do, and that is to relieve pain. By supporting your knee at the patella tendon, and applying a soft, compression pressure on your knees, it helps to relieve knee pain as you play. The relief is swift and immediate. Plus, the soft padding on the strap adds to the comfort that these straps offer. Comfort is prime as you play your sport, and that’s why this patellar tendon strap comes with adjustable straps so you can adjust the strap to fit your knee snugly per time. Sprinting is fun until an injured knee gets in the way. It’s time you got yourself a working knee strap for running so you can live out your passion without hindrance. And the Abco Sports Patella Knee Strap is a great place to look. The overall success of the athlete is the sole concern of Marquee Sports. It is a brand that is totally focused on the all-around wellbeing and health of an athlete. Marquee Sports understands that all athletes need protection and recovery from various injuries. That is why its products have been crafted for the ergonomic well fare of athletes. Oftentimes, a niggling problem can be the difference between successes on the field or track and failure, For this reason, Marquee Sports has come along with a plethora of products that give you quality support and protection all day long. No matter your physical health needs, even if you are not an athlete, Marquee Sports has got you covered. A tendonitis strap helps in alleviating discomfort in major joints especially the knee and elbow. It works by providing compression on your patellar tendon, spreading pressure equally across your patellar tendon to reduce discomfort. Of course, when it comes to physical health, no compromises can be made. You need the best patellar tendon strap to keep you ready to go. To this end, we are offering you the Marquee Sports Patella Knee Strap. With its low profile functionality, this patellar knee strap works perfectly to alleviate your pain. It has a dual-layered outer membrane that is water resistant. Blended with neoprene and nylon, the outer layer is a breathable and water-resistant fabric that ensures you are totally comfortable while using it. This ensures that you don’t sweat excessively while using this strap as maximum airflow is ensured. No matter the atmospheric conditions, just strap it on and you are good to go. It is also very easy to adjust. This is accomplished with the new Strap-And-Go system. Pioneered only for Marquee Products, it allows you to adjust the size of this patellar knee strap with two easy to use straps (The strapping system can be extended up to 22 inches). No matter how big you are, Marquee Sports has got you covered. That isn’t all. This system allows for an unparalleled control of the amount of compression put on your knee by this strap. Every process has been well thought out for your comfort. Worried about using a patellar knee strap together with your work clothes? Perhaps you are worried that it would be too bulky and obvious? Well, we can gladly tell you that this strap solves those problems. 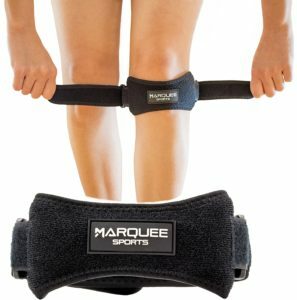 The Marquee Sports Patella Knee Strap is lightweight while it has a slim, sleek design. This means you can wear it under your work clothes or workout gear without any issues. Its extreme light weight also allows you to carry it about without any problem. No more pain wherever you go! Kootek has only been in existence for four years, but it has quickly pushed itself to the top of the fitness market. Originally an electronic accessory producing brand, it has diversified in the past two years to include fitness and physical health accessories. This decision stemmed from a desire to alleviate physical pain in the active man/woman and it has paid off well. Its fitness portfolio contains top of the line products which have been designed hand in hand with fitness and health experts to give you the best. With all products manufactured in the USA, you can be assured that your physical needs will be adequately taken care of by Kootek. After extensive medical consultation, you have come to the conclusion that you need an infrapatellar strap. Designed to spread pressure uniformly around your patellar tendon, these ingenious creations alleviate knee pain awesomely. How then do you select the best patella knee strap from the many out there? Well, you are one step away from total comfort if you select the Kootek Knee Strap. Why? You ask. Keep reading and find out. The Kootek Knee Strap is one of the most comfortable knee straps out there. This is due to the fact that it is made entirely from neoprene. 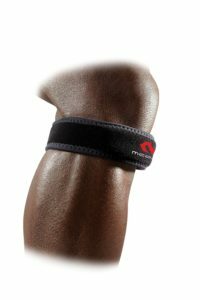 Neoprene is elastic therefore allowing the Kootek Knee Strap to stretch and bend comfortably as you use it. This allows it to remain in place without compromising your comfort and your patellar tendon. Another feature which makes this product a must have is the Knee Pro-Tech technology. 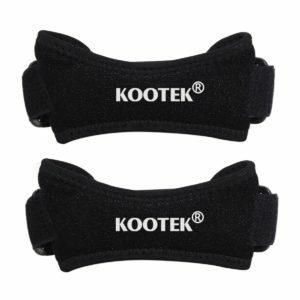 This innovative new tech allows the Kootek Knee Strap to protect your knee while it is in use. It does this by absorbing most of the stress sent your knee’s way. This ultimately reduces vibrations and shakes in your femoral groove (This has been found to improve the overall long-term health of your knee). It also has an SPR-Buffer that alleviates stress and pain in your knee. What more could you want? The Kootek Knee Strap makes use of a double knot strapping mechanism. This essentially means that it is perfectly locked in place even through the most volatile of exercises. Whether you are running for gold or strolling to work, it works perfectly either way. It also has a loop lock tech that prevents it from moving and slipping around. This, coupled with its neoprene material affords for flexible movement without the knee straps gilding and twisting; perfect ease of movement and mobilization all through. Finally, it is made from lightweight material which is machine washable. This makes it a dream patellar tendon strap as it is easy to maintain. Don’t miss this golden opportunity to improve the health of your knee! A brand that originated across the sea in the Orient, IPOW has established itself as a reliable, trusted brand in the western world. It specializes in a wide array of products, including selfie sticks, clothes hangers and fitness accessories. Brands from the Orient are renowned for their innovation and IPOW is no different. IPOW makes use of ergonomic technology for the improved existence of athletes and people all around the world. With a top of the line consumer service, IPOW is primed to give you utmost. For years on end, you have been struggling with that knee problem; a creak here and there when you walk around. Walking has become a chore much less a more active lifestyle. We can guess that you’ve been stressing over different choices to select the best patella knee strap to alleviate your pains. Thankfully, that search is at an end with the IPOW Patella Stabilizer. One of the most functional knee straps in the market, this product combines innovation and comfort like never before. Perhaps you have used different patellar knee straps in the past but none seems to fit perfectly. Well, here is one that will conform perfectly to your knee. The IPOW Patella Stabilizer has a segmented design that allows you to make adjustments depending on your knee. This affords you an almost custom-made experience ultimately leading to better results when it comes to supporting your knee. It is also flexible. Designed with your ultimate usability in mind, the IPOW Patella Stabilizer is crafted with built-in seams. These seams are of the highest quality and allow you to turn your knee while playing sports without compromising the effectiveness and integrity of the knee strap. This patella knee strap also has high ratings when it comes to breathability and comfort. This is because it is made from permeable, soft and breathable material. Forget all about sweating with this patellar knee strap as airflow is always at a guaranteed maximum. This makes it perfect for use in all temperatures. It is also extremely lightweight and can be used daily without any adverse effects. Finally, the IPOW Patella Stabilizer is as advertised. It is as stable as they come. It uses a two-knot design that is flexible enough not to break during strenuous outdoor activity yet strong enough that it supports and stabilizes your patellar tendon perfectly. 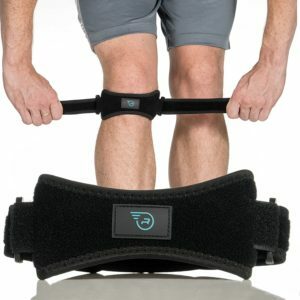 The IPOW Patella Stabilizer is definitely more than just a strap. Paragon Sports has been serving the world of sports with the best sports clothing and equipment for a century and a decade. Since its inception in 1908, the brand has not failed to provide its customers with all they need to get better at the sport they are involved in while they get to enjoy good quality of living. It remains committed to providing the most technologically advanced and innovative products in sports. And in fact, customers testify of pleasant shopping experiences with Paragon. One way Paragon has helped to improve the quality of life of its customers is by introducing an amazing tendonitis knee strap that is designed to relieve people who have had to deal with or are currently dealing with knee injuries. These knee straps provide support and stability for the patellar and knee especially when you are walking, exercising or involved in a sporting activity. Not only that. It also helps with knee issues like Osgood-Schlatter’s disease, osteoarthritis, runner’s knee and chondromalacia. Another amazing thing about the strap is that it is not too tight so that it makes you uncomfortable and it certainly not loses that it begins to slide up and down your knees. In fact, it constantly provides compression on the tendon without getting in the way of easy movement. Wearing it is as simple as ABC. You slide it on to your knees and then use the double strap to hold it in place without compromising on comfort. You will get perfect support and comfort from the soft padding and the breathable fabric that prevents moisture retention at the knees. Thinking of something that will be suitable for an adult or a teenager? Then you should go for this patellar tendon band. This is because it can fit well on all knee circumferences within the range of 11 inches to 22 inches. If you, like most people who use knee straps, don’t like straps that irritate the skin or wear under certain weather conditions, then you should go for these straps. They stay in place all day without being too tight or loose. 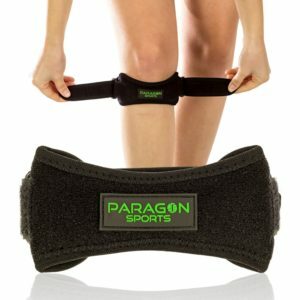 Paragon Sports is so certain about the fact that this strap will be the best patella strap you’ll use that it backs your order with a full refund. So, what are you waiting for? Get it already, will you? In 2008, AGPTEK had a successful entrance into the audio market and has since then gained entrance into the world of electronics, sports, toys, games, and home improvement products. Its wide range of products are now being sold and distributed in countries like the United States, Germany, France, the United Kingdom, Italy, Japan, Canada, and Spain. It remains committed to its dream to constantly deliver remarkable products at affordable prices. Its products also keep spreading to many countries around the world without a reduction in their quality. 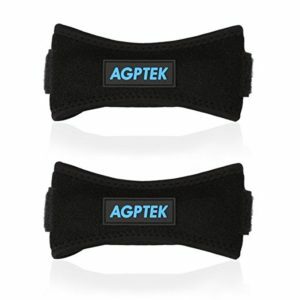 If you are looking for the best patella strap for your knees; especially if you don’t want a painful knee to prevent you from your regular sports activities, then you should try out the AGPTEK Adjustable Knee Pad. This pad is sold in pairs but can be purchased as a 1-piece pack if you want the work done on just one knee. It is also designed to fit the knees of both women and men and can be adjusted to perfection to avoid a grip that is too firm and uncomfortable to the knees or a one that is too loose and slides up and down your knees at the slightest movement. It is also super easy to put on and take off when you need to and comes with a pad that assures you of comfort during workouts. What’s more? It provides pressure relief to the patella so that the knees can take up to 3 times as much pressure as its own weight during jumps. And if you’ve got pain issues that are related to inflammation or irritation of the patella tendon as a result of sports activities or occupational sports, then you should certainly get this knee pads. We can say much about its lightweight feature that makes the straps feel like they are not even on your knees to avoid distractions that may prevent you from achieving your personal sport goals. Another thing we love about this patellar tendon knee strap is that it provides shock absorption as well as impact protection during strenuous exercises. So your confidence will double up when you face harmful obstacles during intense activities. Mueller Sports is the legendary pioneer of sports medicine in the United States and started 6 decades ago in a young man’s basement. The founder, Curt Mueller, simply changed the world of sports medicine by integrating his knowledge of pharmacology and sports together to improve the quality of life of athletes and sports enthusiasts. Today, the brand churns out cutting-edge sports equipment for athletes at every skill level. It also maintains its approach to satisfying its customers – getting personal with the athletes to know what they truly need and finding a way to meet those needs. 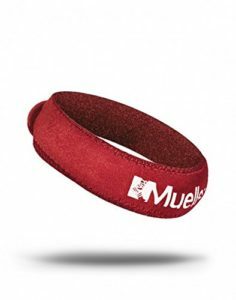 One of such products where Mueller sports shows an intimate knowledge of the athlete’s needs is the Mueller Jumpers Knee Support Strap. This knee support strap comes in 7 different amazing colors and is available in just one size. Oh, don’t think you are going to miss out on this offer yet. Now, because it is an adjustable strap, this knee support can actually fit knees with circumferences between 10 and 22 inches (25 to 55cm). All you need to do is measure the circumference of your knee, if you don’t know it already and see if the strap will make a perfect fit. Also, because the size basically depends on knee circumferences, almost anyone should be able to wear it – teenagers and adults alike. Like we said, the trick is to have a knee circumference that falls within the strap’s range. Moreover, the strap is designed to relieve you from pains caused by frequent jumping and running. So, say you’ve stopped making hoops and hitting the track just because of a painful patellar tendon, here’s a strap that will get you back in the game without hassles. And if you’ll like to wear it all day, just go ahead and do that. We say this because the strap provides a comfortable but firm (not too firm that it cuts blood circulation though) grip that allows you go about your activities without as much a distracting thought as the idea that your strap may be sliding down your leg or that it is too tight on your knees. Ps: This knee strap comes just as one-piece-a-pack. But if you need it for both knees then you can place an order for 2 of it. We weren’t going to forget to mention that the strap comes with a tubular insert that is designed to improve and enhance patella elevation and tracking by applying very little pressure to the tendon under the kneecap. McDavid has been designing, manufacturing and marketing sports medicine, performance apparel, and sports protection for well over 4 decades. Whenever a list of what athletic trainers, pro athletes, and professionals in sports medicine need is made, its products will usually top the lists. Among its high-quality products is its ankle brace that is backed up by a lot of research. Unlike the average manufacturer in the sports industry, McDavid deals with a good number of specific and broad-range needs of athletes at different levels and from different kinds of sports. So, if you are looking for the best knee strap to cater to your knees’ needs, we recommend the McDavid Knee Support Strap. This is a patellar strap that is designed to reduce the symptoms and also relieve you of the pain that comes with patellar tendon issues like tendonitis, runners knee, and Osgood-Schlatter disease. It features an adjustable loop and hook fastener that allows you to adjust the strap to fit the circumference of your knees perfectly. For the perfect fit, you may want to take advantage of the different sizes it offers so that you’ll be certain to get one that is not too tight and cuts off blood circulation or one that is too loose and will slide down your legs at the slightest movement. The sizes to choose from are small, medium, and large. This will easily fall into the category of the best knee strap again because it has a tubular strip embedded in it that will not slip out but is designed to apply constant and uniform compression to your knee tendon. The idea, at the end of the day, is to provide pain relief and put you in the best position to take on your sports without hassles. We will also root for this knee strap because it is a level 2 strap. That is, it doesn’t just offer protection to your knees, but offers the advanced type of protection. Finally, no worries about whether not you should be specific about the knee you need it on because it fits both the right and left knees perfectly. However, if you need a pair for both knees, then you need to place an order for 2. Of course, this is definitely not every single detail you need to know about knee straps but this is, however, a very great start. With all the information you have gleaned so far, you should, by now, understand your need for knee straps as a sportsperson as well as the best type of knee strap for you. Don’t let an injured patella get you on your knees. Get a great knee strap and carry on with your life!